Fred’s annotated map showing mining areas along the British Front. 251TC’s area around Cuinchy is circled. In May 1915 Fred Brown enlisted as a private soldier in the 18th Battalion Royal Fusiliers at the age of 17 years, 10 months. After training at Clipstone Camp, Nottinghamshire and Tidworth Camp the Battalion sailed for France in November 1915 as part of 98th Brigade, 33rd Division, soon transferring to 19th Brigade in the same Division. After a short time the Battalion entered trenches near Festubert north of the La Bassée Canal. Following a hard winter spent in and out of the trenches and in hope of a six week break away from the front in Rouen Fred volunteered for a course of engineering. 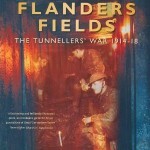 Sadly for Fred and his fellow volunteers the course was far from what was envisaged – they were now temporarily attached for fatigue duties to 251 Tunnelling Company, Royal Engineers, billeted in nearby Béthune. Their role was to acts as ‘beasts of burden’, working underground removing spoil excavated from the face by more experienced miners. 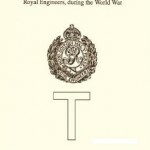 After a few weeks Fred applied for a transfer and was accepted into the Royal Engineers as 256302, Sapper Fred Brown. 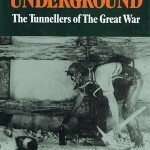 He served with 251 Tunnelling Company for the remainder of the war. Toward the end of his life Fred recorded his wartime experiences in typed form and by tape recorder. These were left with his second wife’s family who have been kind enough to pass them on to me. My thanks to Mary Burgess for her kindness. The photographs used in the Audioboo links are of a dapper looking Fred in later life. The recordings are not brilliant quality, being taken from old D90 cassette tapes. Over the next few weeks I will post as many of Fred’s audio recordings as possible. 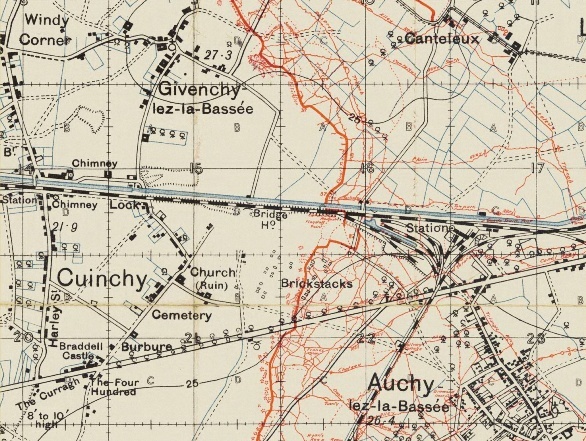 British trench map extract from December 1915 showing trench lines around Cuinchy and Auchy. 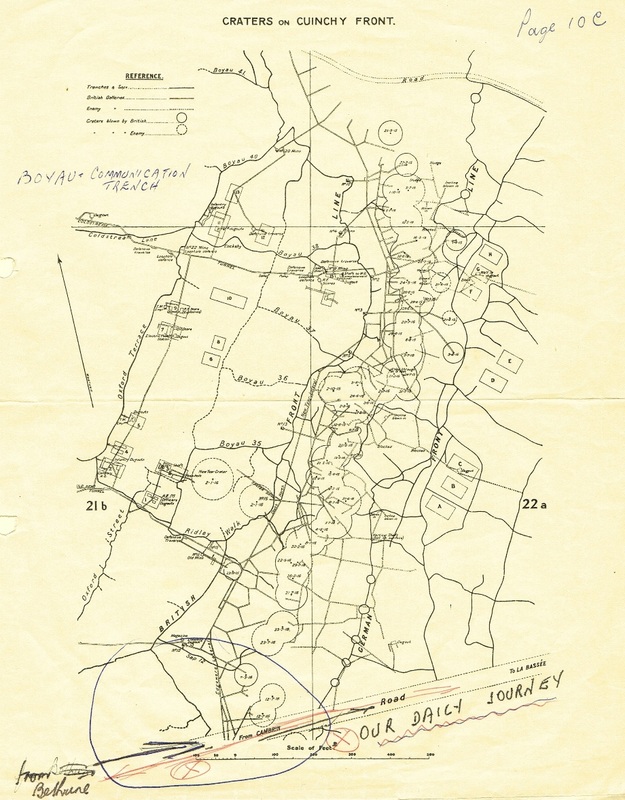 Mine workings and tunnel plans – craters on the Cuinchy Front. Fred’s handwritten annotations show his daily journey to work from Béthune. This entry was posted on Wednesday, April 3rd, 2013 at 2:53 pm	and is filed under Miscellany, Research. You can follow any responses to this entry through the RSS 2.0 feed. You can leave a response, or trackback from your own site. 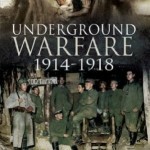 Many thanks for your reply on the Great War Forum. I will listen to the recordings shortly. Sapper Henry Wilson Thomas’s service number was 132352. He died on 25/12/1917 aged 23 years. He was the son of Ellen Jane Thomas of Atlantic View, Trevellas, St Agnas, Scorrier, Cornwall. Last year, my wife & I visited Bethune, found his grave and laid flowers on it. Believe it or not, we were the first members of the family to visit the grave. Even until just before his death, my Dad’s last remaining brother….he was one of a family of 12 boys and 1 girl…refused to tell us anything about Wilson. It’s so sad that because of their Methodist roots & religion, nobody ever spoke of him because his mother was not married when he was born and so were the black sheep of the family. So Fred’s recordings are another useful insight for me. Thanks Penny – I am glad to hear they were so useful. Now I have some time free I plan on adding plenty more over the winter so do keep checking back.